FUSO is a brand with proven reliability that is characterised by its robustness and fuel efficiency. The models also boast outstanding payload and ride comfort. Competing in the light, medium and heavy duty truck segment, the FUSO brand is recognised as a key player within the commercial vehicle segment and is popular in the courier and logistics industry. For over 80 years, FUSO has been producing durable, reliable vehicles. FUSO plays an important role at Daimler Trucks as the competence centre for light-duty trucks. With a comprehensive range, ZIMOCO is confident that you will find the right model to meet your business requirements. Visit the Harare Showgrounds and take a look at our full range. Whichever FUSO model you would like to order - ZIMOCO has it! The new generation FUSO Canter has been completely re-engineered from the wheels up and is one of the most forward-thinking, innovative medium duty commercial trucks available on the market. Each vehicle is specifically designed for the medium to small businessman whose livelihood depends on his transport being dependable, rugged and reliable. Each FUSO Canter is highly specc’d with comfort and safety features to match. The chassis cab design allows flexibility for the fitment of different load body types to suit all applications. This medium duty truck builds a tough base for individual needs. Download FUSO Canter FE/FG Brochure Here. The new FUSO FA9-137 is designed for maximum profitability, with a greater carrying capacity. The FA9-137 can generate greater profits for your business. You can also increase your margins by taking advantage of the truck’s lowered total cost of ownership, reduced driver fatigue and safer cabin. The FA9-137 comes in two models: the Tipper and the Freight Carrier. Standard across both models comes a 6-speed transmission, a common rail engine with four valves per cylinder, designed to deliver ample power and torque while lowering operating costs, and a robust chassis. When a medium to heavy-duty truck is your choice, the FUSO FK/FM series with its contemporary styling and robust chassis to match is the logical way to move maximum payloads. Look no further for a reliable, high quality and thoroughly durable truck series that will exceed your expectations. These medium-to heavy-duty trucks with their easy-going personality and hard working design are ideal as moving vans, tippers, roll-back auto recovery and a host of other applications. The FUSO FK/FM series offers a variety of efficient, economical and powerful engines with one of the roomiest, most comfortable and well appointed cabs in the business. Download FUSO Fighter FK/FM/FN Brochure Here. 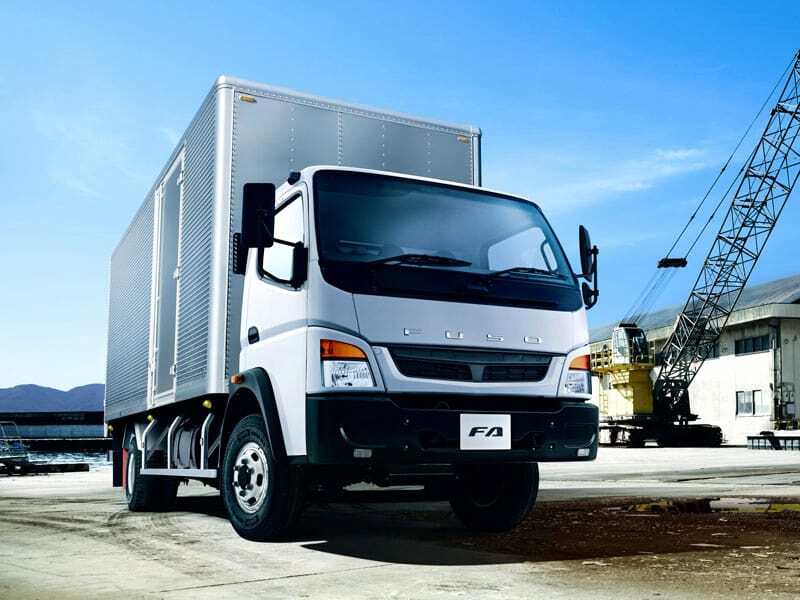 The FUSO FP/FV extra heavy-duty series is indeed a force to be reckoned with. Now, world proven heavy truck technology is available in 4x2 and 6x4 configurations with GVM’s from 18 to 26 tonnes. The new extra heavy models are the synthesis of 80 years of FUSO technology and automotive know how and are truly excellent in terms of driver comfort, safety, durability and economy. Download FUSO SuperGreat FP/FV Brochure Here.